Review from the Newsletter of the World Association of Soil and Water Conservation Volume ? ?, Number ?? month – month year. Page ??. The Conservation and Improvement of Sloping Land, Voulme III: Practical Application – Soil and Water Conservation. P.J. Storey. 2003. 349 pp. ISBN 1-57808-234-1, Science Publishers, Inc. www.scipub.net), P.O. Box 699, Enfield, New Hampshire 03784, USA. 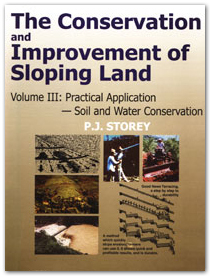 This is the third and final volume of Peter Storey’s trilogy on The Conservation and Improvement of Sloping Land. Volume II dealt mainly with soil improvement while this volume deals more directly with the related subject of soil and water conservation. As with the other two volumes, this book is based on the author’s many years of practical experience in the mountainous regions of the humid tropics and aims to be a practical guide to the field worker. Part 1 of the book includes seven chapters of background information on soil erosion and the theory behind the use of various practices. Part 2 deales with the practical aspects of such subjects as livestock management, agroforestry, field trials, research and development and extension as they apply to soil and water conservation. The last part of the book is devoted to eight fairly lengthy appendices that provide excellent information on such practical subjects as assessing soil moisture content in the field, how to make a simple bulldozer for a two wheeled tractor, and simple methods of surveying. Peter Storey’s views are not always orthodox and he does not mind criticizing some of the currently promoted systems of soil and water conservation, such as the vetiver system widely advocated in recent years by the World Bank. However, the reader can be sure that all the practices that he recommends in the book have been personally checked and tested in the regions where he has worked. As with Volume II, I believe that this book will be a very useful guide to many of our field workers. It is the sort of book that many field project leaderscould profitably buy and proide for the staff they are training as extension workers.